Often, we can isolate ourselves on our spiritual journeys. 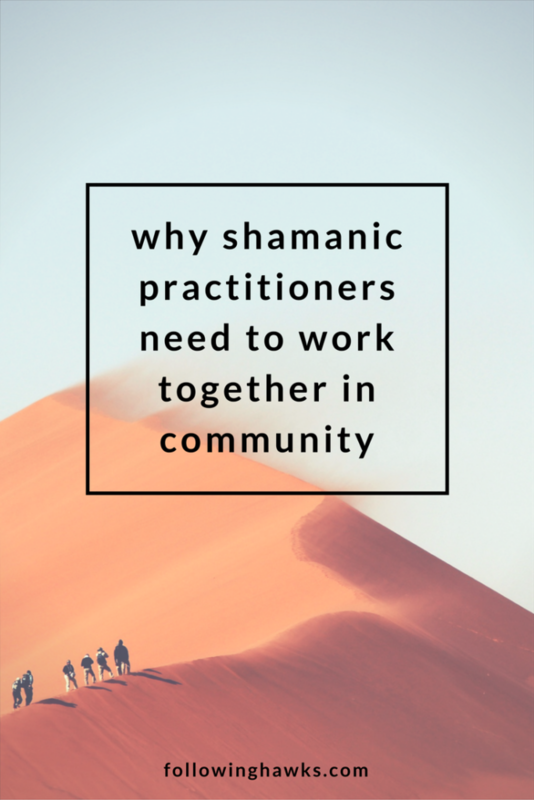 They feel so personal, but I’d like to share my thoughts on why shamanic practitioners need to work together in community. I had intended a lighter post for this week, but it seems the universe had other plans for me. We had another big round of storms this week and another nearby mountain (although not my mountain) was hit by lightning. The energy from the storm affected me deeply and knocked me off kilter for a day or two. I was completely sapped and I had a headache that just wouldn’t quit and a stomach ache that came and went. I’ve been doing this long enough now that I usually know the difference of a physical issue versus an energetic issue. I did a journey to ask….what the hell is going on right now?! And what’s with this latest storm? I was told that these energetic downloads are happening grid by grid and that the energy is intense right now. They also said I’m feeling it even more because it’s related to my work. So I asked if I needed to do anything with the mountain that was hit by lightning during this storm and was told no, that’s someone else’s job. Hmm, okay. While I was dragging around and attempting to take naps that just didn’t seem to happen this week, I did listen to a podcast episode that really got my attention. And I realized it was the second piece to last week’s story. As I’ve been learning to do this work, it’s been somewhat in isolation. I definitely have the support of others that I can bounce things off of, but when I’m in my journey, doing energetic work, it is only me and my spirit guides and there is only so much that I can do. The podcast, with Christina Pratt and Kelley Harrell was asking the question of whether or not we’re changing the spirit world. In their work, they have begun to come across beleaguered spirit guides and spirits of the land that seem a bit tapped out. They’re unable to continue doing their work, in some cases, without our help and cooperation. There are many potential reasons for that and you can listen to both shows on the topic if you’re interested. However, on this most recent show, they spent some time talking about how shamanic work is much more than just a self-help modality. While we can use it to do our personal work and heal (and we should), we have to be responsible for doing that work and then reaching out beyond ourselves. Personal healing will always be a journey and will never be complete, but at some point, we need to find (or reach out to) our community and bring our unique medicine. Shamanic practitioners need to work together in community. We haven’t been true custodians of the land for many generations and it needs our attention. Whether we are aware of it or not, we are a draw on these energies and are depleting them and we owe a debt to the world in which we live every day. We can’t be lone rangers out on the prairie doing our work all alone. The issues in the spirit world cannot be healed by one person. All of our unique gifts are necessary. So what can we do? Christina and Kelley say that we must authentically and honestly DO THE WORK that we are called to do and ask where our gifts would be most effective. The medicine the world needs is here, it’s just latent. Places (like the mountain in my backyard) are calling out to us. We need to work with our helping spirits and each other, linking up to do the work. We are the people we’re waiting for. So, if you’re here, then this message is for you. The world is changing and it needs us to work in community. We cannot ignore the spirits and expect them to just follow behind us cleaning up the messes we make. Most of the messages I received from you over the past week said something like: I’m hearing / seeing / sensing / dreaming these messages as well. What should I do next? My guides are pestering me to create a meditation to help us connect with the grid and receive messages and I’m working on it now. Be sure to sign up for my list to be the first to hear about it when I get it done. In the meanwhile, it seems like we are creating a community here. I hope that you feel welcome and I hope that we can work together to do the whatever it is we are each called to do. Not just because it makes our individual lives better (because it does!) but also because whether we realize it or not, we are doing our parts for a better community and a better world. YES! LETS DO A MEDITATION! LET’S DO IT! Will it be online so anyone can join?? I’m thinking it will be an audio file that you can download and do whenever you want!